Wire Wrapping is advertised as a book that will teach you to "create stunning wire jewelry designs, no experience required"
By the time I received this book as a gift in 2009 I had been wire wrapping for 3 years. When I read the book I did so from cover to cover and I believe the publishers claim to be true. 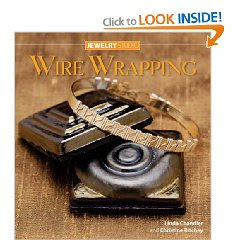 Jewelry Studio: Wire Wrapping begins with the very basics a chapter devoted to tools and materials with clear pictures and easily understandable descriptions. Chapter 2 discusses modifying pliers and handling wire. There can be found the obligatory safety rules and instructions for making jump rings and a basic bracelet clasp. The remaining chapters are devoted to projects basic and more advanced. The first is a very basic wire wrapped bangle bracelet, the type that becomes a wardrobe staple. The next several projects are variations on the basic design-all with clear photographs and detailed instructions. These projects are intended to develop your wire handling skills and to encourage you to take a basic design and make it your own. The book also includes instructions for a basic ring wire wrapped ring and a basic cabochon wrap. Jewelry Studio: Wire Wrapping does not present any new or cutting edge designs. What it does very well is teach you the basic skills and techniques necessary to wire wrapping. Master these 4 chapters and let your imaginations soar!